Thrombosis (from Ancient Greek θρόμβωσις thrómbōsis "clotting”) is the formation of a blood clot inside a blood vessel, obstructing the flow of blood through the circulatory system. When a blood vessel (a vein or an artery) is injured, the body uses platelets (thrombocytes) and fibrin to form a blood clot to prevent blood loss. Even when a blood vessel is not injured, blood clots may form in the body under certain conditions. A clot, or a piece of the clot, that breaks free and begins to travel around the body is known as an embolus. Thrombosis may occur in veins (venous thrombosis) or in arteries (arterial thrombosis). 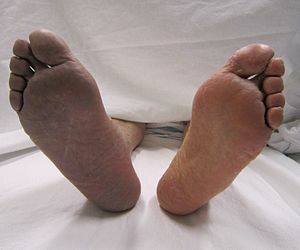 Venous thrombosis leads to congestion of the affected part of the body, while arterial thrombosis (and rarely severe venous thrombosis) affects the blood supply and leads to damage of the tissue supplied by that artery (ischemia and necrosis). A piece of either an arterial or a venous thrombus can break off as an embolus which can travel through the circulation and lodge somewhere else as an embolism. This type of embolism is known as a thromboembolism. Complications can arise when a venous thromboembolism (commonly called a VTE) lodges in the lung as a pulmonary embolism. An arterial embolus may travel further down the affected blood vessel where it can lodge as an embolism. Thrombosis is generally defined by the type of blood vessel affected (arterial or venous thrombosis) and the precise location of the blood vessel or the organ supplied by it. Budd-Chiari syndrome is the blockage of a hepatic vein or of the hepatic part of the inferior vena cava. This form of thrombosis presents with abdominal pain, ascites and enlarged liver. Treatment varies between therapy and surgical intervention by the use of shunts. Portal vein thrombosis affects the hepatic portal vein, which can lead to portal hypertension and reduction of the blood supply to the liver. It usually happens in the setting of another disease such as pancreatitis, cirrhosis, diverticulitis or cholangiocarcinoma. Renal vein thrombosis is the obstruction of the renal vein by a thrombus. This tends to lead to reduced drainage from the kidney. Jugular vein thrombosis is a condition that may occur due to infection, intravenous drug use or malignancy. Jugular vein thrombosis can have a varying list of complications, including: systemic sepsis, pulmonary embolism, and papilledema. Though characterized by a sharp pain at the site of the vein, it can prove difficult to diagnose, because it can occur at random. Cavernous sinus thrombosis is a specialised form of cerebral venous sinus thrombosis, where there is thrombosis of the cavernous sinus of the basal skull dura, due to the retrograde spread of infection and endothelial damage from the danger triangle of the face. The facial veins in this area anastomose with the superior and inferior ophthalmic veins of the orbit, which drain directly posteriorly into the cavernous sinus through the superior orbital fissure. Staphyloccoal or Streptococcal infections of the face, for example nasal or upper lip pustules may thus spread directly into the cavernous sinus, causing stroke-like symptoms of double vision, squint, as well as spread of infection to cause meningitis. Arterial thrombosis is the formation of a thrombus within an artery. In most cases, arterial thrombosis follows rupture of atheroma (a fat-rich deposit in the blood vessel wall), and is therefore referred to as atherothrombosis. Arterial embolism occurs when clots then migrate downstream, and can affect any organ. Alternatively, arterial occlusion occurs as a consequence of embolism of blood clots originating from the heart ("cardiogenic" emboli). The most common cause is atrial fibrillation, which causes a blood stasis within the atria with easy thrombus formation, but blood clots can develop inside the heart for other reasons too. Myocardial infarction (MI) or heart attack, is caused by ischemia, (restriction in the blood supply), often due to the obstruction of a coronary artery by a thrombus. This restriction gives an insufficient supply of oxygen to the heart muscle which then results in tissue death,(infarction). A lesion is then formed which is the infarct. MI can quickly become fatal if emergency medical treatment is not received promptly. If diagnosed within 12 hours of the initial episode (attack) then thrombolytic therapy is initiated. An arterial thrombus or embolus can also form in the limbs, which can lead to acute limb ischemia. Hepatic artery thrombosis usually occurs as a devastating complication after liver transplantation. Thrombosis prevention is initiated with assessing the risk for its development. Some people have a higher risk of developing thrombosis and its possible development into thromboembolism. Some of these risk factors are related to inflammation. "Virchow's triad" has been suggested to describe the three factors necessary for the formation of thrombosis: stasis of blood, vessel wall injury, and altered blood coagulation. Some risk factors predispose for venous thrombosis while others increase the risk of arterial thrombosis.. The main causes of thrombosis are given in Virchow's triad which lists thrombophilia, endothelial cell injury, and disturbed blood flow. Hypercoagulability or thrombophilia, is caused by, for example, genetic deficiencies or autoimmune disorders. Recent studies indicate that white blood cells play a pivotal role in deep vein thrombosis, mediating numerous pro-thrombotic actions. Any inflammatory process, such as trauma, surgery or infection, can cause damage to the endothelial lining of the vessel's wall. The main mechanism is exposure of tissue factor to the blood coagulation system. Inflammatory and other stimuli (such as hypercholesterolemia) can lead to changes in gene expression in endothelium producing to a pro-thrombotic state. When this occurs, endothelial cells downregulate substances such as thrombomodulin, which is a key modulator of thrombin activity. The end result is a sustained activation of thrombin and reduced production of protein C and tissue factor inhibitor, which furthers the pro-thrombotic state. Endothelial injury is almost invariably involved in the formation of thrombi in arteries, as high rates of blood flow normally hinder clot formation. In addition, arterial and cardiac clots are normally rich in platelets–which are required for clot formation in areas under high stress due to blood flow. Causes of disturbed blood flow include stagnation of blood flow past the point of injury, or venous stasis which may occur in heart failure, or after long periods of sedentary behaviour, such as sitting on a long airplane flight. Also, atrial fibrillation, causes stagnant blood in the left atrium (LA), or left atrial appendage (LAA), and can lead to a thromboembolism. Cancers or malignancies such as leukemia may cause increased risk of thrombosis by possible activation of the coagulation system by cancer cells or secretion of procoagulant substances (paraneoplastic syndrome), by external compression on a blood vessel when a solid tumor is present, or (more rarely) extension into the vasculature (for example, renal cell cancers extending into the renal veins). Also, treatments for cancer (radiation, chemotherapy) often cause additional hypercoagulability. There are scores that correlate different aspects of patient data (comorbidities, vital signs, and others) to risk of thrombosis, such as the POMPE-C, which stratifies risk of mortality due to pulmonary embolism in patients with cancer, who typically have higher rates of thrombosis. Fibrinolysis is the physiological breakdown of blood clots by enzymes such as plasmin. Organisation: following the thrombotic event, residual vascular thrombus will be re-organised histologically with several possible outcomes. For an occlusive thrombus (defined as thrombosis within a small vessel that leads to complete occlusion), wound healing will reorganise the occlusive thrombus into collagenous scar tissue, where the scar tissue will either permanently obstruct the vessel, or contract down with myofibroblastic activity to unblock the lumen. For a mural thrombus (defined as a thrombus in a large vessel that restricts the blood flow but does not occlude completely), histological reorganisation of the thrombus does not occur via the classic wound healing mechanism. Instead, the platelet-derived growth factor degranulated by the clotted platelets will attract a layer of smooth muscle cells to cover the clot, and this layer of mural smooth muscle will be vascularised by the blood inside the vessel lumen rather than by the vasa vasorum. Ischaemia/infarction: if an arterial thrombus cannot be lysed by the body and it does not embolise, and if the thrombus is large enough to impair or occlude blood flow in the involved artery, then local ischaemia or infarction will result. A venous thrombus may or may not be ischaemic, since veins distribute deoxygenated blood that is less vital for cellular metabolism. Nevertheless, non-ischaemic venous thrombosis may still be problematic, due to the swelling caused by blockage to venous drainage. In deep vein thrombosis this manifests as pain, redness, and swelling; in retinal vein occlusion this may result in macular oedema and visual acuity impairment, which if severe enough can lead to blindness. A thrombus may become detached and enter circulation as an embolus, finally lodging in and completely obstructing a blood vessel, which unless treated very quickly will lead to tissue necrosis (an infarction) in the area past the occlusion. Venous thrombosis can lead to pulmonary embolism when the migrated embolus becomes lodged in the lung. In people with a "shunt" (a connection between the pulmonary and systemic circulation), either in the heart or in the lung, a venous clot can also end up in the arteries and cause arterial embolism. Arterial embolism can lead to obstruction of blood flow through the blood vessel that is obstructed by it, and lack of oxygen and nutrients (ischemia) of the downstream tissue. The tissue can become irreversibly damaged, a process known as necrosis. This can affect any organ; for instance, arterial embolism of the brain is one of the cause of stroke. The use of heparin following surgery is common if there are no issues with bleeding. Generally, a risk-benefit analysis is required, as all anticoagulants lead to an increased risk of bleeding. In people admitted to hospital, thrombosis is a major cause for complications and occasionally death. In the UK, for instance, the Parliamentary Health Select Committee heard in 2005 that the annual rate of death due to thrombosis was 25,000, with at least 50% of these being hospital-acquired. Hence thromboprophylaxis (prevention of thrombosis) is increasingly emphasized. In patients admitted for surgery, graded compression stockings are widely used, and in severe illness, prolonged immobility and in all orthopedic surgery, professional guidelines recommend low molecular weight heparin (LMWH) administration, mechanical calf compression or (if all else is contraindicated and the patient has recently suffered deep vein thrombosis) the insertion of a vena cava filter. In patients with medical rather than surgical illness, LMWH too is known to prevent thrombosis, and in the United Kingdom the Chief Medical Officer has issued guidance to the effect that preventative measures should be used in medical patients, in anticipation of formal guidelines. The treatment for thrombosis depends on whether it is in a vein or an artery, the impact on the person, and the risk of complications from treatment. Warfarin and vitamin K antagonists are anticoagulants that can be taken orally to reduce thromboembolic occurrence. Where a more effective response is required, heparin can be given (by injection) concomitantly. As a side effect of any anticoagulant, the risk of bleeding is increased, so the international normalized ratio of blood is monitored. Self-monitoring and self-management are safe options for competent patients, though their practice varies. In Germany, about 20% of patients were self-managed while only 1% of U.S. patients did home self-testing (according to one 2012 study). Other medications such as direct thrombin inhibitors and direct Xa inhibitors are increasingly being used instead of warfarin. Thrombolysis is the pharmacological destruction of blood clots by administering thrombolytic drugs including recombitant tissue plasminogen activator, which enhances the normal destruction of blood clots by the body's enzymes. This carries an increased risk of bleeding so is generally only used for specific situations (such as severe stroke or a massive pulmonary embolism). Arterial thrombosis may require surgery if it causes acute limb ischemia. Mechanical clot retrieval and catheter-guided thrombolysis are used in certain situations. Arterial thrombosis is platelet-rich, and inhibition of platelet aggregation with antiplatelet drugs such as aspirin may reduce the risk of recurrence or progression. ^ Furie B, Furie BC (2008). "Mechanisms of thrombus formation". New England Journal of Medicine. 359 (9): 938–949. doi:10.1056/NEJMra0801082. PMID 18753650. ^ Handin RI (2005). "Chapter 53: bleeding and thrombosis". In Kasper DL, Braunwald E, Fauci AS, et al. Harrison's Principles of Internal Medicine (16th ed.). New York, NY: McGraw-Hill. ISBN 978-0-07-139140-5. ^ Webster, GJ; Burroughs AK, Riordan SM (January 2005). "Review article: portal vein thrombosis – new insights into aetiology and management". Alimentary Pharmacology & Therapeutics. 21 (1): 1–9. doi:10.1111/j.1365-2036.2004.02301.x. PMID 15644039. Archived from the original on 2012-12-10. ^ Canhão, P; Ferro JM, Lindgren AG; et al. (August 2005). "Causes and predictors of death in cerebral venous thrombosis". Stroke. 36 (8): 1720–1725. doi:10.1161/01.STR.0000173152.84438.1c. PMID 16002765. ^ Bekker, J.; Ploem, S.; de Jong, K. P. (April 2009). "Early Hepatic Artery Thrombosis after Liver Transplantation: A Systematic Review of the Incidence, Outcome and Risk Factors". American Journal of Transplantation. 9 (4): 746–757. doi:10.1111/j.1600-6143.2008.02541.x. PMID 19298450. ^ a b c d e f g h i j k l m n o p q r s Hoffman, p. 960. ^ a b Moliterno, p. 306. ^ a b c d e f g h i j Copstead, p. 320. ^ a b c d e f g h i Moliterno, p. 307. ^ a b c d e f g h i j k l m n o p q r s t u v w x Brunner, p. 875. ^ a b c d Copstead, p. 329. ^ "Pacing wire". The Free Dictionary. Retrieved 2016-12-18. ^ Swystun, L. L.; Liaw, P. C. (27 June 2016). "The role of leukocytes in thrombosis". Blood. 128 (6): 753–762. doi:10.1182/blood-2016-05-718114. PMID 27354721. ^ a b c d e labtestsonline > Hypercoagulable Disorders Archived 2007-06-18 at the Wayback Machine This article was last reviewed on May 23, 2007 and was last modified on March 6, 2010. ^ a b c Kumar, Vinay (2015). Robbins and Cotran Pathologic Basis of Disease. Philadelphia, PA, USA: Elsevier. pp. 122–130. ISBN 978-1-4557-2613-4. ^ Ito, Takashi; Kakihana, Yasuyuki; Maruyama, Ikuro (2016-01-01). "Thrombomodulin as an intravascular safeguard against inflammatory and thrombotic diseases". Expert Opinion on Therapeutic Targets. 20 (2): 151–158. doi:10.1517/14728222.2016.1086750. ISSN 1744-7631. PMID 26558419. ^ van der Hulle, T; den Exter, PL; Kooiman, J; van der Hoeven, JJ; Huisman, MV; Klok, FA (2014). "Meta-analysis of the efficacy and safety of new oral anticoagulants in patients with cancer-associated acute venous thromboembolism". J Thromb Haemost. 12 (7): 1116–20. doi:10.1111/jth.12605. PMID 24819040. ^ National Institute for Health and Clinical Excellence. Clinical guideline 92: Venous thromboembolism: reducing the risk for patients in hospital. London, January 2010. ^ a b Hunt BJ (March 2008). "Awareness and politics of venous thromboembolism in the United kingdom". Arterioscler. Thromb. Vasc. Biol. 28 (3): 398–9. doi:10.1161/ATVBAHA.108.162586. PMID 18296598. ^ a b Geerts WH, Pineo GF, Heit JA, et al. (September 2004). "Prevention of venous thromboembolism: the Seventh ACCP Conference on Antithrombotic and Thrombolytic Therapy". Chest. 126 (3 Suppl): 338S–400S. doi:10.1378/chest.126.3_suppl.338S. PMID 15383478. Archived from the original on 2004-10-11. ^ Dentali F, Douketis JD, Gianni M, Lim W, Crowther MA (February 2007). "Meta-analysis: anticoagulant prophylaxis to prevent symptomatic venous thromboembolism in hospitalized medical patients". Ann. Intern. Med. 146 (4): 278–88. CiteSeerX 10.1.1.694.4563. doi:10.7326/0003-4819-146-4-200702200-00007. PMID 17310052. ^ Heneghan C, Ward A, Perera R (2012). "Self-monitoring of oral anti-coagulation: systematic review and meta-analysis of individual patient data". The Lancet. 379 (9813): 322–334. doi:10.1016/S0140-6736(11)61294-4. PMID 22137798. Brunner, Lillian (2010). Brunner & Suddarth's textbook of medical-surgical nursing. Philadelphia: Wolters Kluwer Health/Lippincott Williams & Wilkins. ISBN 9780781785907. Copstead, Lee (2013). Pathophysiology. St. Louis, Mo: Elsevier. ISBN 9781455726509. Moliterno, David (2013). Therapeutic advances in thrombosis. Chichester, West Sussex: Wiley-Blackwell. ISBN 9781405196253. Wikimedia Commons has media related to Thrombosis.